HeyPlantMan! 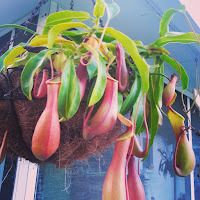 Exotic Tropical Plants from St. Pete FL: February Happenings and Pre-Spring Cleanout ! February Happenings and Pre-Spring Cleanout ! Ahhh, Spring...well, almost ! For many of us, the recent gorgeous weather makes us want to freeze time, as this is the perfect time for plants and gardeners alike. Last week at Sat. Morning Market, we had record crowds and record sales which was truly a gift after the preceding 3 weeks when we were struggling. Thank you all for coming out ! This weekend, we expect the same, and have lots of new product too. 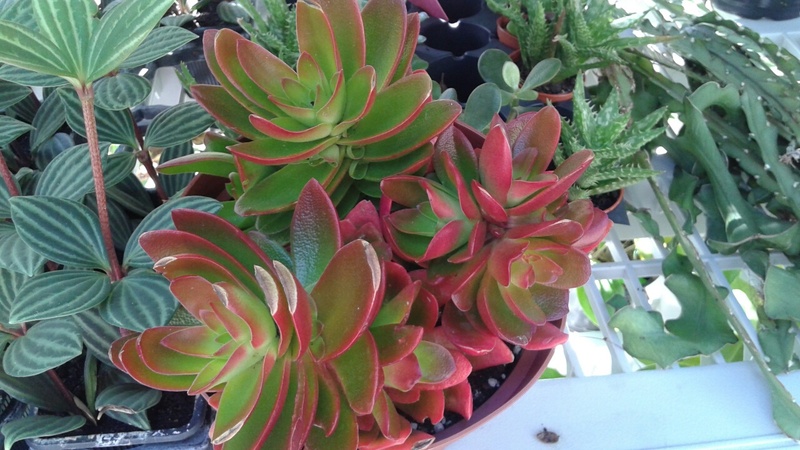 Pictured above,"Campfire" Succulent (Crassula erosula) is one of the beauties we found this week. We have always carried the 3 inch size, but this older plant, in 8 inch pot, really shows the size and exciting color that comes out in more sun, especially this time of year. 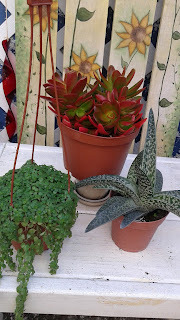 Along with Campfire, we have new "Spotted Aloe", and the delicate "Baby Tears" ( Soleirolia) in hanging baskets and 4 inch pots. .Baby Tears is a popular for it's delicate hardiness in hanging baskets, as a ground cover, perfect for pots and terrariums! 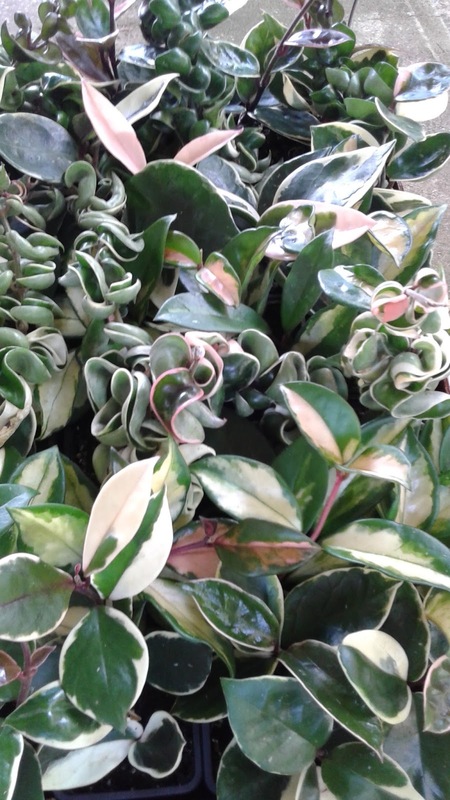 Hoyas are one of our customers favorite plant. 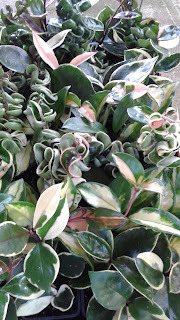 And there are so many varieties, such as the Hindu Rope Hoya pictured here. Slow growing, loving shade/filtered light, they make excellent specimens for porches, and as a hardy house plant. We are resupplied with hundreds of new baby succulents, each one chosen for its individuality, health, size and color/texture. 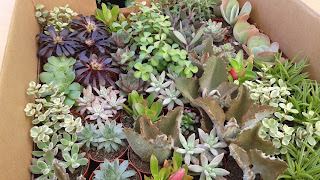 Although we grow many succulents ourselves, we do buy from other growers who have the space to carry so many varieties and we spent many hours in greenhouses, picking them out ourselves. By now, we have learned which ones are the most beautiful, the most hardy and easiest for our customers to care for. We strive to get a mix of colors/hues, textures and varigation that will all make a fantastic display. 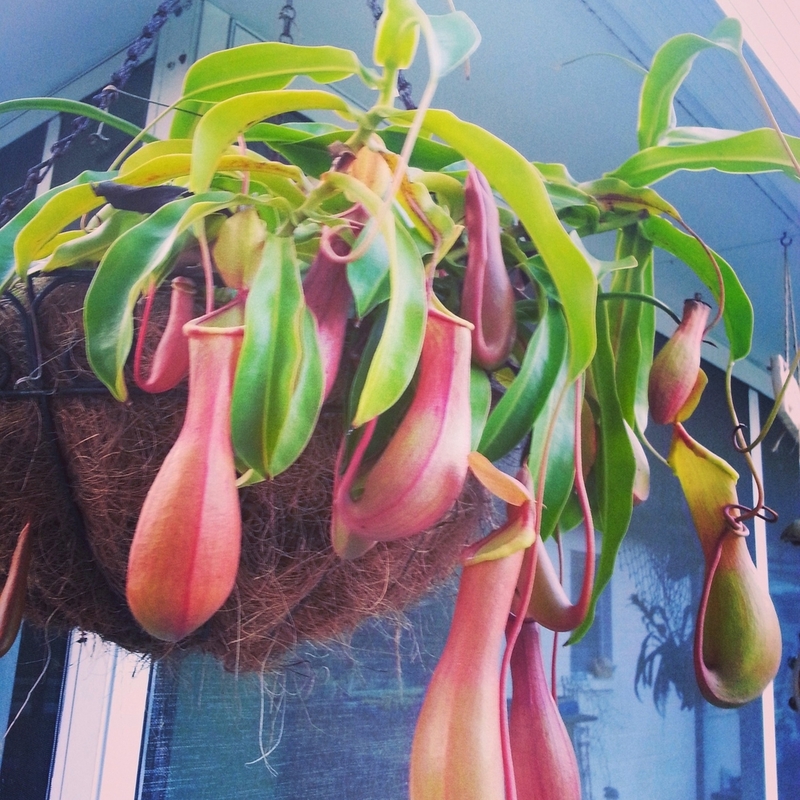 The pic at right is of the Pitcher Plant (Nepenthes alata), one of the most unique plants around, that will love hanging in your patio or your shade garden. 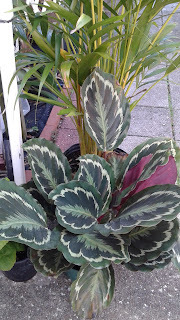 The Broadleaf Calathea at left, is one of Annie's favorites..in fact, she loves ALL Calatheas ! Its loved for its durability, texture and drama and so versatile..for home, office, patio, shade gardens. Calatheas are commonly thought of as "prayer plants", as in at night, their leaves gently fold "up", looking like praying hands. Morning comes and the leaves gently relax outward. This weekend, we will be back at Saturday Morning Market for another beautiful late Winter time day, and, we are also having a pre-Spring Cleanout Sale at our house in St. Pete. This time of year, we need to make room for stock for our upcoming Spring shows and its a great time for you to come out and get some bargains ! 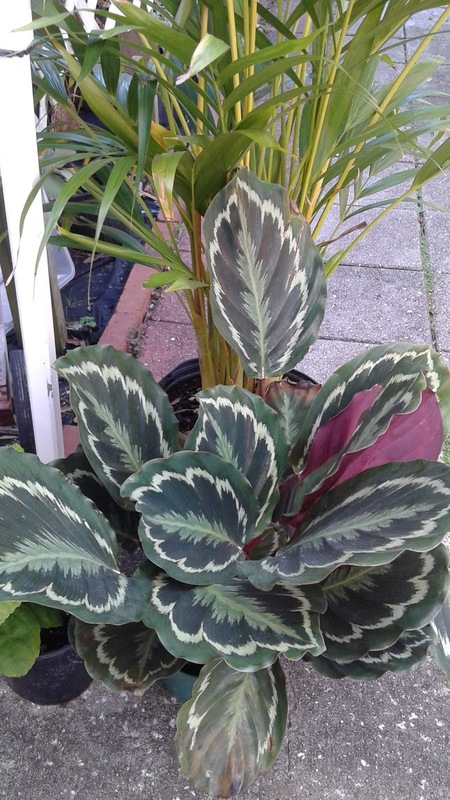 We have lots of "one of a kind", or "last one of the inventory" plants that need good homes. Along with the bargain plants, we will have regular stock of succulents, perennials, palms, Vines etc on sale too. If you can't make Market, this is an easy way to come by for a garden tour and get some plants to start your Spring Planting. Yard sale runs this Friday and Saturday ! Lastly, we want to re-rerun our posting of all of our Spring Botanical Sales and Market Dates coming up ! Sat. Feb. 27th, our crew will be at Sat. Morning Market while Annie & Mitch head to the 2 days Arts, Craft and Plant fest at Bell Tower Shops Crossing in North Ft. Myers. Sat. March 5th - Sat. Morning Market moves to Central Avenue due to Grand Prix activities. Because of this, we will be heading to beautiful Gilchrist Park, in Punta Gorda for a 2 day Arts, Crafts and Plant Fest with MY Promotions. The Punta Gorda shows runs Sat and Sun, March 5 & 6th, from 10am-4pm each day.